Welcome to the third episode of the Pantscast. This time it’s hosted by Amy McDaniel and features Zach Dodson and his extraordinary new book, Bats of the Republic. Check out our review of the book, by Alban Fischer. Listen using the embedded player above, or subscribe on iTunes. Also on this episode, we’re really proud to present an 8-minute excerpt from the book, read by Will Oldham. Movie Times Ep. 8: "Star Wars"
Joe and Cheryl sojourned to Maryland for Jesus's birthday and watched the newest Star Wars installment. They talked all about daddy issues, the difficulties of representing impersonal suffering, the bureaucratic face of evil, nostalgia, girl warriors, and just why Stars Wars makes bajilliions of dollars. 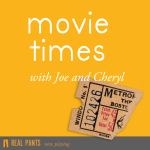 Movie Times Ep. 7: "Crimson Peak"
Joe and Cheryl watched Crimson Peak, the new spooky Gothic romance from Guillermo del Toro, just in time for Thanksgiving. They talked about being scared, not being scared, and friendly ghosts.